Turkish Restaurant Week – According to the Turkish Festival website, Turkish Restaurant and Cuisine Week will take place September 17-26 at select Turkish Restaurants. 4-course menu for $25. This is not a large list of venues, but could be a great way to try a new restaurant featuring this cuisine, or revisit an old favorite. Taste of Friendship Heights – Now in its fourth year, this event features samples from more than a dozen local restaurants. It will go from 12 to 5 pm on Saturday, September 25th at the Friendship Heights Village Center in Chevy Chase, MD. Taste of Friendship Heights is organized by the Friendship Heights Urban Network (FHUN) and the Village of Friendship Heights. Food and drink tickets are $5 for 4 tickets. A portion of the proceeds from the event will be donated to the Community Council for the Homeless at Friendship Place. Visit the website for more information. Taste of Bethesda – The 21st annual Taste of Bethesda is scheduled for Saturday, October 2, 2010 and showcases 50 restaurants and four stages of entertainment. Taste tickets will be sold on-site in bundles of four tickets for $5, and servings cost one to four tickets. The event is held along Bethesda’s Woodmont Triangle, three blocks from the Bethesda Metro. Additional information can be found here. Taste of Dupont 2010 – This new event comes from the Historic Dupont Circle Main Streets group and is scheduled for Tuesday, October 5, from 6 – 9 pm. The idea is to create a progressive dinner by visiting any of the 13 participating restaurants with $5 individual tasting tickets. Many will also have special price cocktails or wines paired with the tastings. Tastings can also be bought in packages of 5 for $20, with additional discounts for larger groups. Tickets can be purchased online, or starting at 5pm on the day of the event at the Dupont Resource Center. It seems more restaurants may be added before the event date, so be sure to check the website for more details. Taste of Georgetown – The 17th annual Taste of Georgetown takes place Saturday, October 9th, from 11 am to 4 pm on Wisconsin and M Streets, benefiting the Georgetown Ministry Center. Thirty area restaurants will be on hand to offer tastes, as well as a wine and beer pavilion and jazz from Blues Alley. One tasting costs $5, with 5 for $20. According to the website, tickets will be available for purchase online starting in August, but that doesn’t seem to be the case yet so check for updates. We will update the site frequently with more events and information as things come our way. Feel free to send us a tip if you know of anything as well! Speaking of fall food events, did you hear about Dogtoberfest at the Dogfish Head Ale House? My husband and I went over to their Falls Church location to sample the recently tapped Punkin Ale, and saw initial promotions for the event which will take place October 25, 26 and 27 (one night at each of their three locations). The menu is deliciously fall themed and there’s a beer to go with each course. Yum. 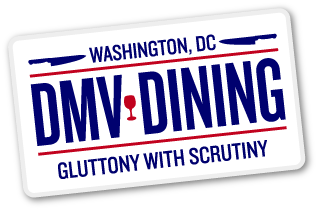 Could be a tasty opportunity to try out the V part of DMV Dining. Ooh I like it, it’s a definite possibility!